Power Rangers! Pretty much a yearly thing to have Power Rangers in your Happy Meals. 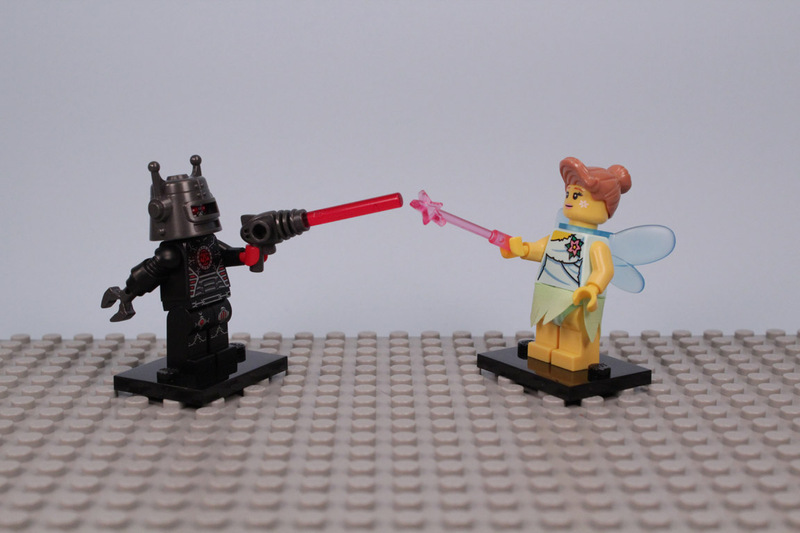 I like this assortment idea, with half figures, half weapons. The weapons mostly disc launchers are kind of zippy to play with. Look for the highly detailed Shark Sword Disc Launcher, I would take that in a bar fight first thing. Also of course, I recommend the blue ranger too. I found some time, and was able to do some more 'thought out' smooshing on series 8. I pretty much abandoned the bump code method this time, as I couldn't mark the black packs with a black sharpie effectively. 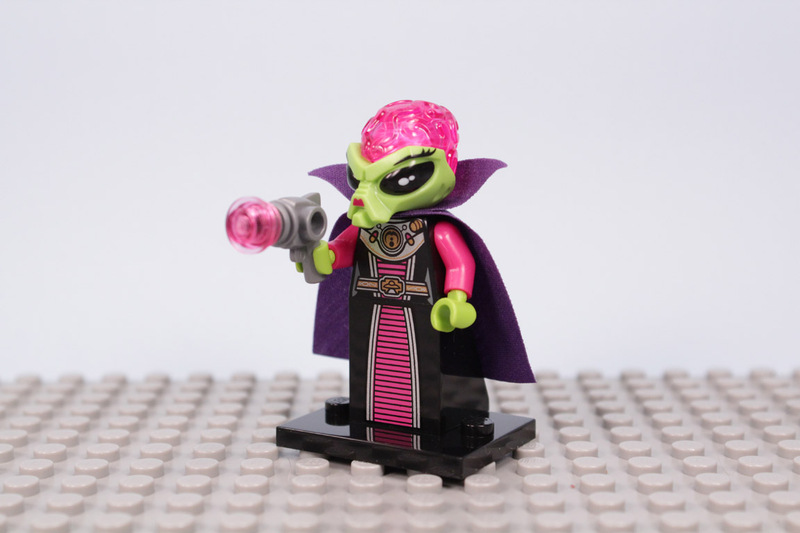 The figure I had to hunt the most for, was the figure that should be the easiest, the Alien Villainess. With her large dress brick, she's an easy smoosh ID, I just couldn't find her right away. I also had the hardest time building her, as the standard lego head piece that goes inside her Alien head, rolled away when I opened the pack. I kept trying to fit the pink brain on top of the green face plate, and they would not snap together. I was confused, until I looked around the table and found the pink head piece that combines the two together. Nice story. I pretty much smooshed out all the ones I wanted, over the course of 15 agonizing minutes. I aways like to see the store employees watch over their shoulders at that nerdy Lego guy doing the smooshing. I am not the only one, I see others smooshing away too. So now days, I just pitch a tent and get to work with no shame. Series 8 with be known as the series with feather hats. 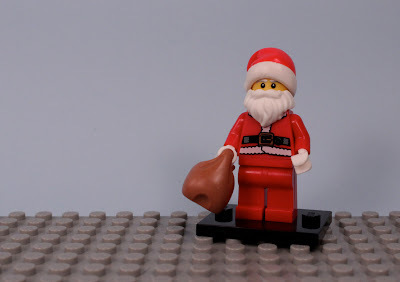 It's too bad they didn't equip Santa and the Cowgirl with a feather too. 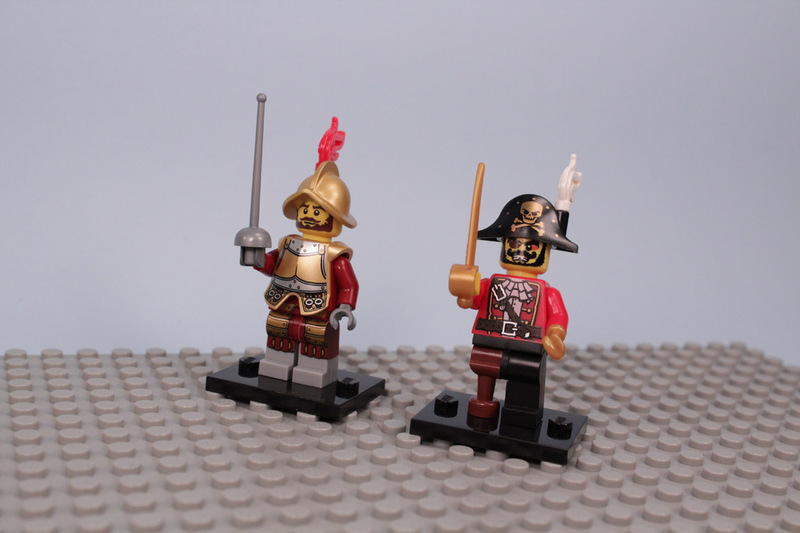 I like how the Conquistador's helmet has a little more gold shine and wish the Diver's helmet did too. Both these guys are prime for stop motion animation possibilities. 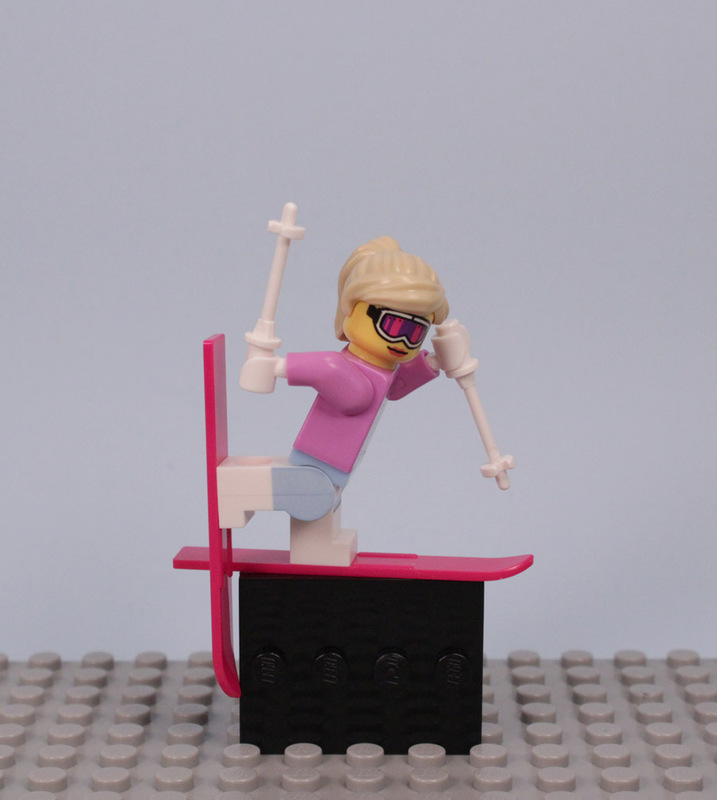 The Downhill Skier is cute, but I wish they could find a better way to have her stand on her base with the skis. 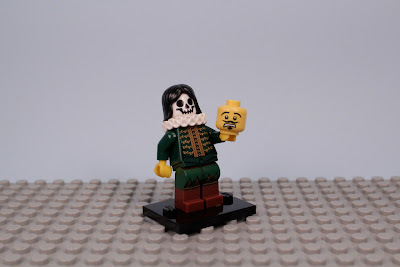 The Actor is classic Lego Minifigure madness. 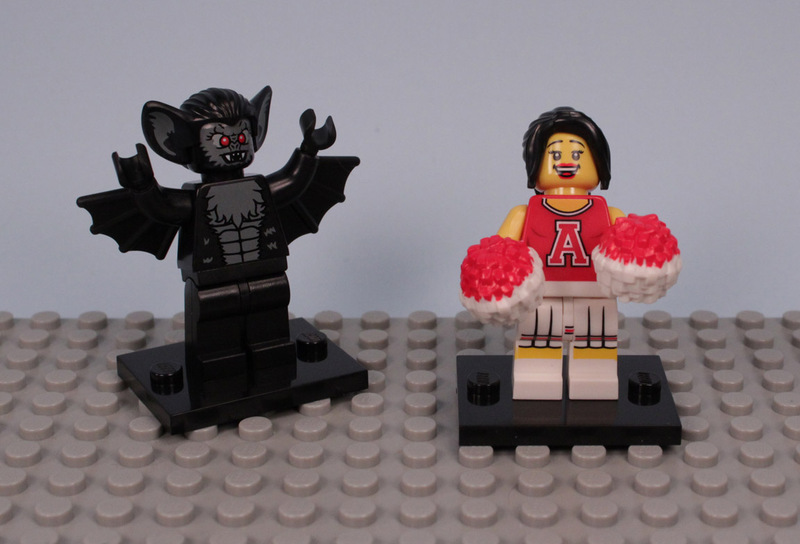 The Big draw for series 8 is the Red Cheerleader, even the Vampire Bat wants some of that red. I have doubles of Business Man and Conquistador. Not sure if I want to return them yet for the hunt for Football player and DJ. If anyone wants to trade before I do so, let me know. 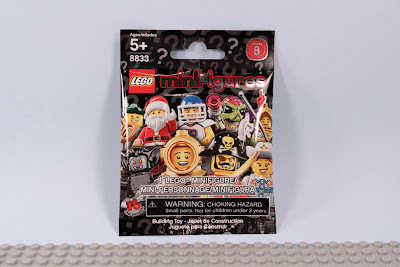 Welp, Lego Minifigures Series 8 is out and about in a black bag this time. I was in a hurry, so I just grabbed a few to start, and luck would not shine on me for the ones I wanted. I can make do though, and sometimes its the weird characters that make the most magic. 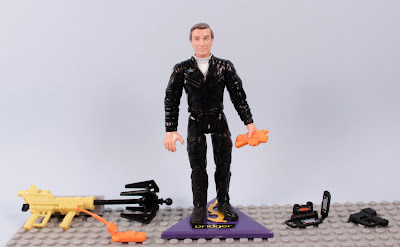 I did get the Classic Sea diver, so I shouldn't say I didn't get ALL the ones I wanted. 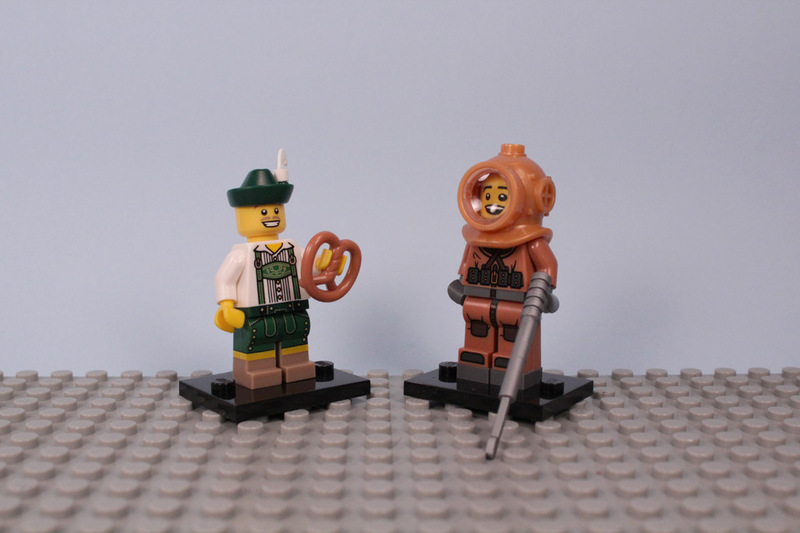 The Lederhosen Guy is missing a beer, or at least a mug, come on. 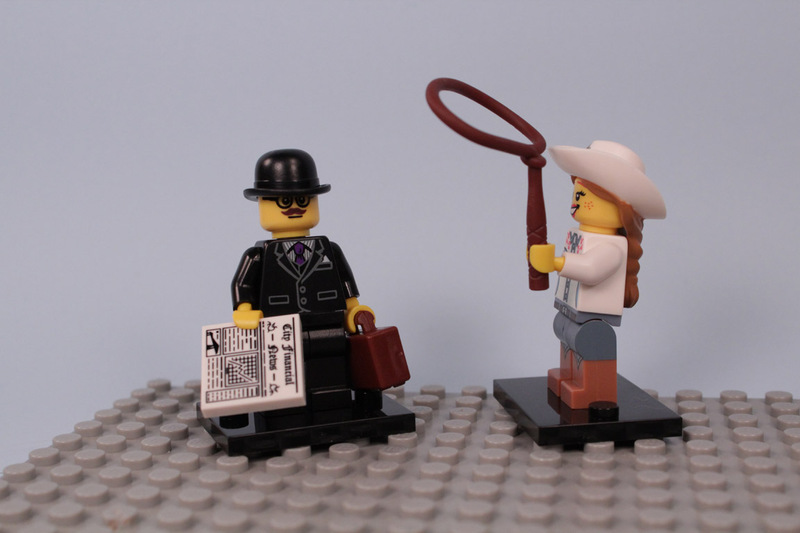 Businessman just feels uninspiring (plus I got two), and Cowgirl also felt a tad plain. So not the best start, but I am looking forward to getting out tomorrow and finding the ones that are "Epic"; Vampire Bat, Evil Robot, Football Player, Alien Villainess, and Pirate Captain. Those should also be easy to smoosh find, as they all have pieces that are identifiable. 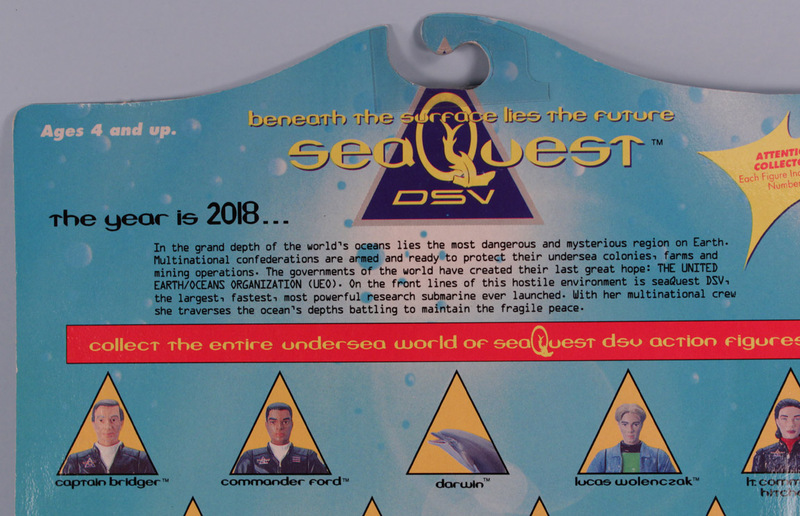 Ah SeaQuest, such grand memories! 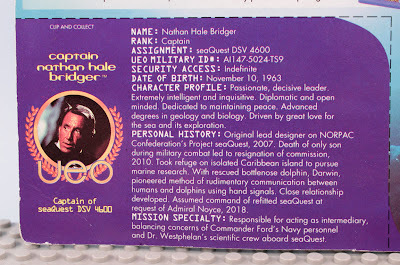 Captain Bridger was a surprise find at Time Zone Toys. I kind of always wanted to get him to companion with Darwin the dolphin (shown below). 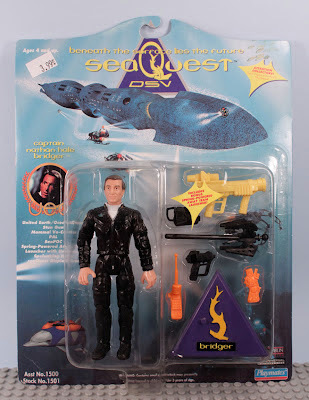 SeaQuest toys are pretty much forgotten, and have little value, so I had no problem freeing him from his mint-ness. Playmates Toys action figures in the early/mid 90's were probably the best realistic replications of TV show and movies characters of the time. 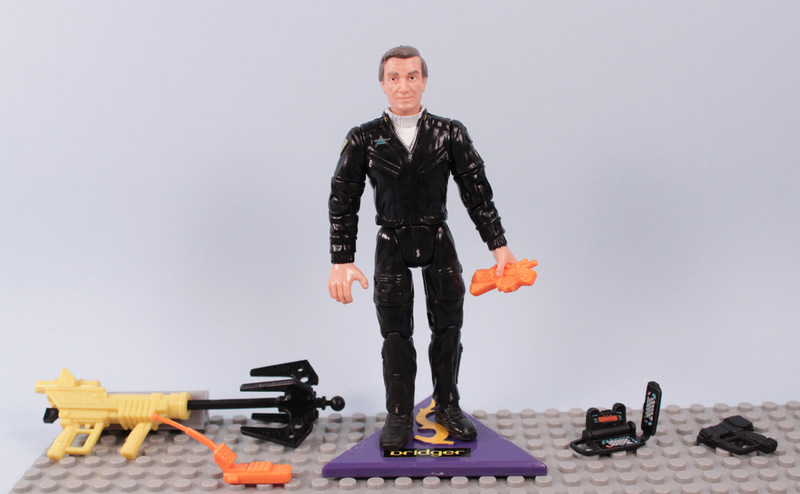 Way beyond the frozen muscle bound men of Kenner's designs. Playmates had a good amount of articulation, and with pretty good human scale proportions. 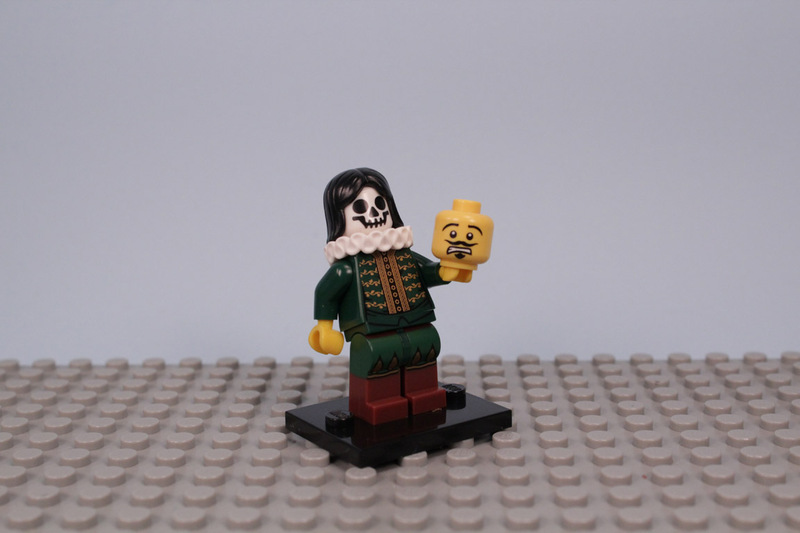 The head sculpts balanced more to the cartoony side, but the likeliness was still really good. 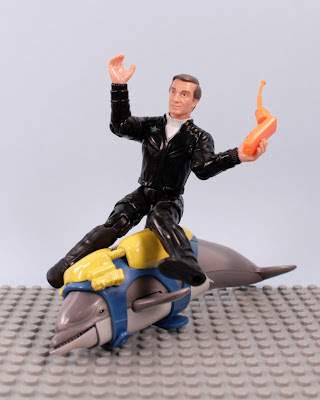 Its a shame the toy lines eventually fizzled out, or I guess Star Trek stuff bombed out in sales. 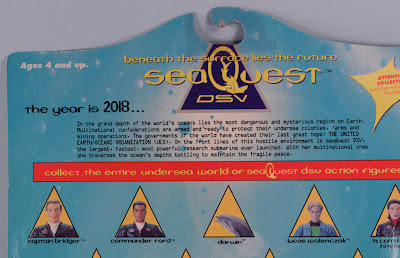 To reminisce, I watched a few of the old SeaQuest episodes on Netflix yesterday. It was surprisingly still pretty good for your standard 90's sci-fi show format. You could see the show cost a pretty penny with really nice set designs and special effects for TV. The writing was a bit corny though, with too many explanations for why things are the way they are for the audience to catch up. The show was set in 2018, which was waaaaay too close for what they imagined the future to be. 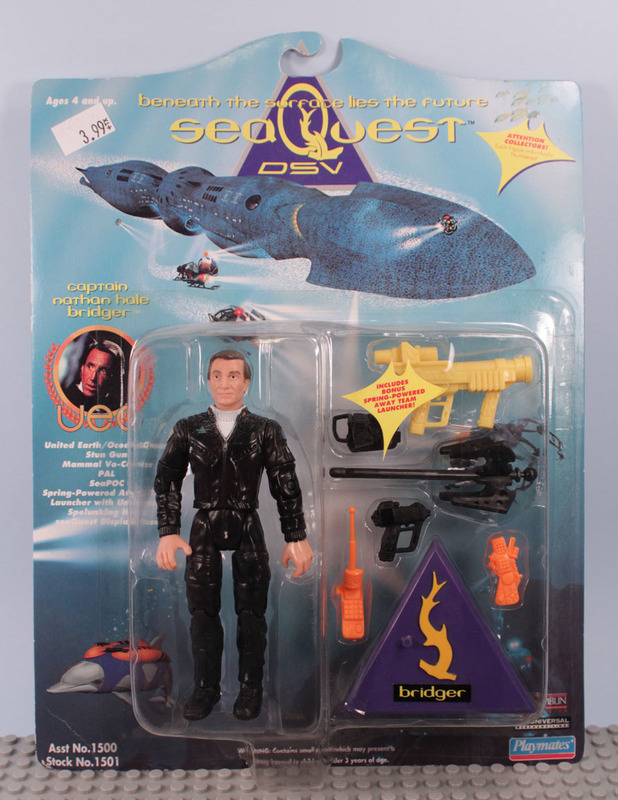 The first episode was really silly, with a rouge semi-retired Captain Bridger being forced back into deciding if he wanted to serve again as Captain of the SeaQuest. The late Roy Scheider does a convincing act of wanting absolutely NO part in the job , but at the very end seems to do a 180 and go, "Okay I will, weeeee!" 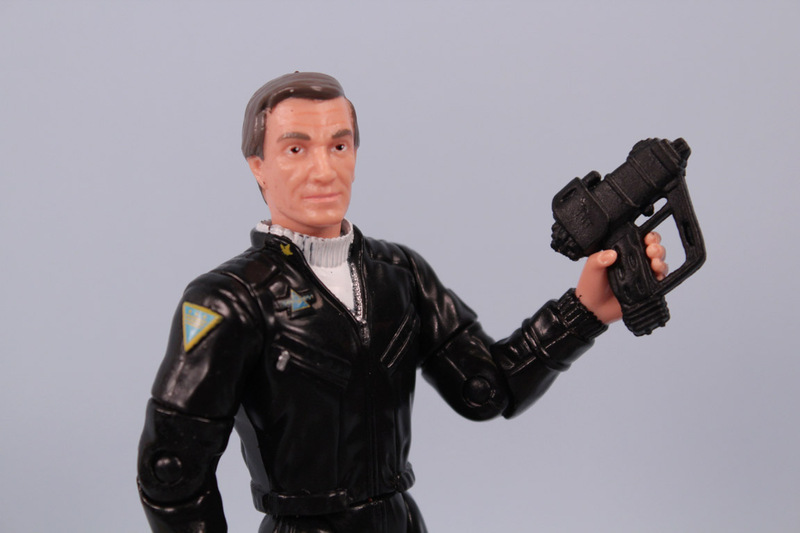 I hope to find Lucas Wolenczak next as he might be the lamest action figure ever made. 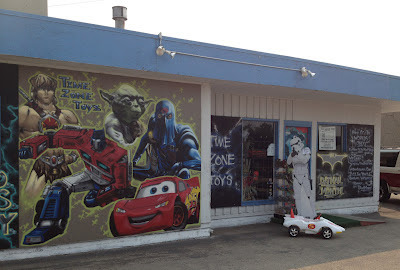 Time Zone Toys In Boise is Epic Awesome! 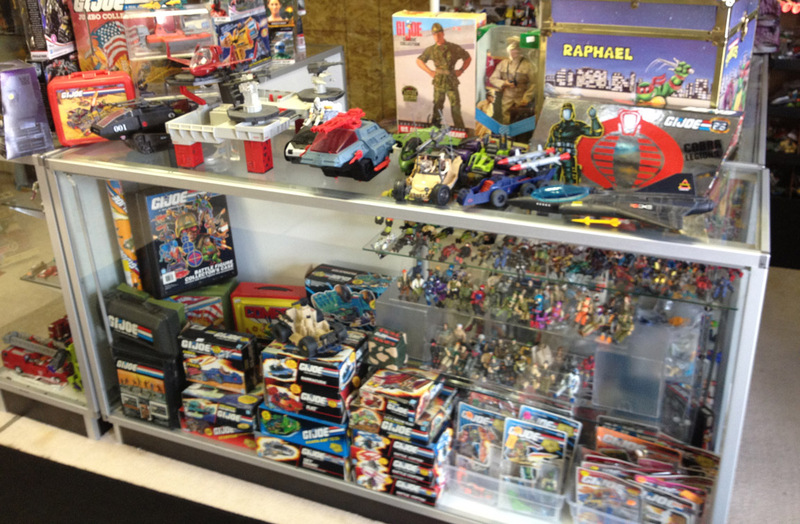 My jaw was literally on the floor the entire time on my first trip to the newly opened Time Zone Toys in Boise. I am so happy to report about a new toy store in the area that buys sells and trades toys. I was shocked to see such a huge amount of inventory for a store that just opened. Not just packed with packaged toys from current to classic, unpackaged toys are abundantly found, many that I have never seen in the wild. A huge, solid GI Joe display case is happening, with a store goal on having the largest GI Joe selection in the great Northwest (Unless I empty that case out on my next visit). 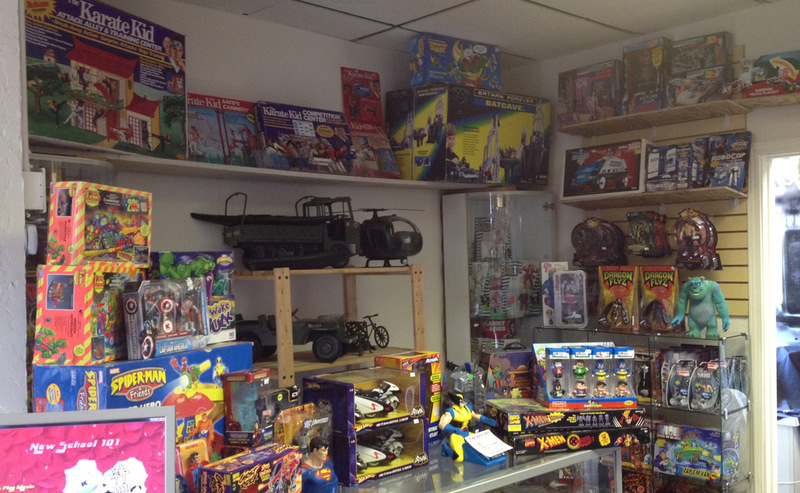 So many classic toys to send you time traveling; Karate Kid, Batman Forever, 90210 Dolls, Skeleton Warriors, Bill and Ted toys, and SeaQuest to name just a tiny percentage. I am looking forward to getting the opportunity to do some trading with some of the boxed and open stuff I have hoarded over the years, and probably some buying too (prices were very fair). Seeing all this great stuff gives me some good perspective on keeping collections in control too. WELL WHAT DID I GET, YOU ASK??? I traded a few old things for; that nice reissue Mego Batman (Yeah, can't believe I missed that in stores). A shiny bluuuuuuue Power Ranger from the first movie (scratch that off my list). 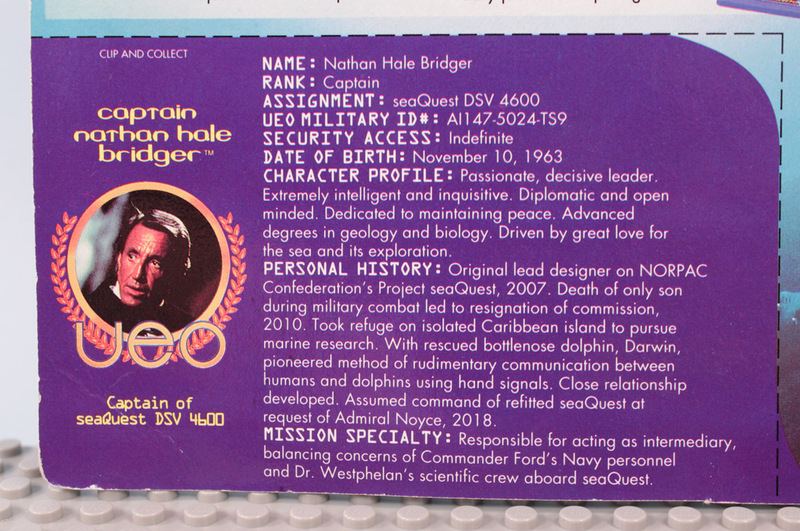 And Captain Bridger from SeaQuest (I have a Darwin that needs his master). 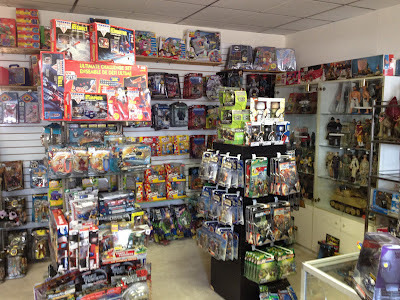 I am already excited for my next visit, with inventory moving around, there should be new stuff to see every visit. The store is a clean and vibrant place to be, and I hope they add a "Norm's Bar Stool" for me to sit in, as that guy who never leaves. Looks like I am going the full effort, and getting the first main wave of the new TMNT toys. 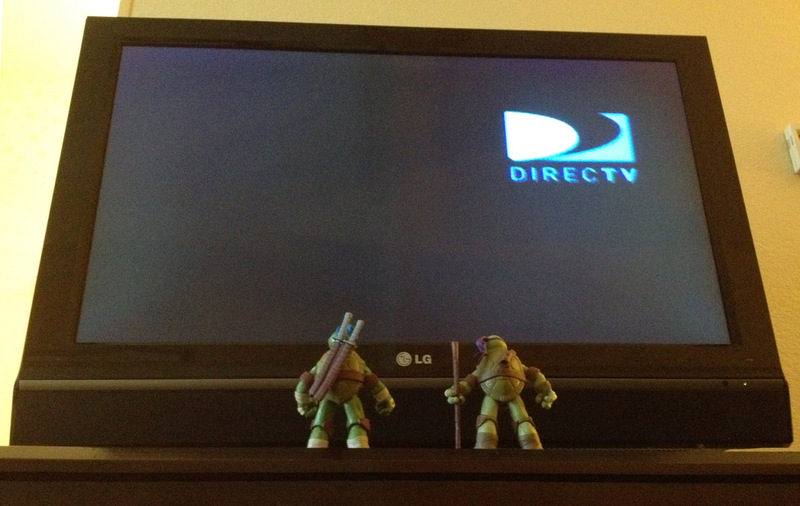 I find the Turtles very well made, but so far Kraang and Shredder are lacking. Still, they are a fantastic upgrade to my vintage collection. The Crazy Cubes toy looked kind of fun for a quick try, here are my adventures with it. Shoot Play and Collect they say by Spin Master. I can't try to get them all, but a few are worth a try. Maybe the bowling set next time. 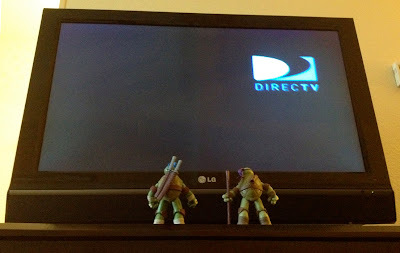 Once the novelty of the giant toilet wore off, the turtles took in some Olympics; the sport of waiting for the Directv Logo to hit the exact corner of the screen. 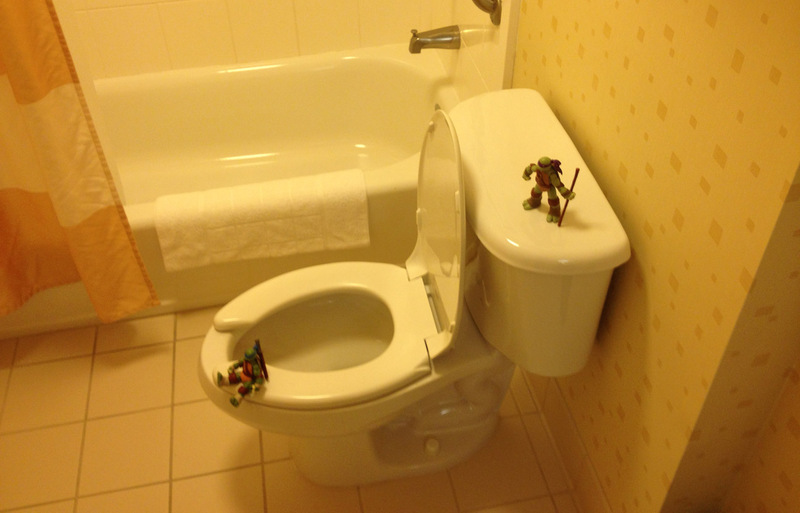 I warned you that the Turtles were distracted by the toilet, thinking they were trying to find their way home. In other news, disinfect your hands when playing with Leonardo. 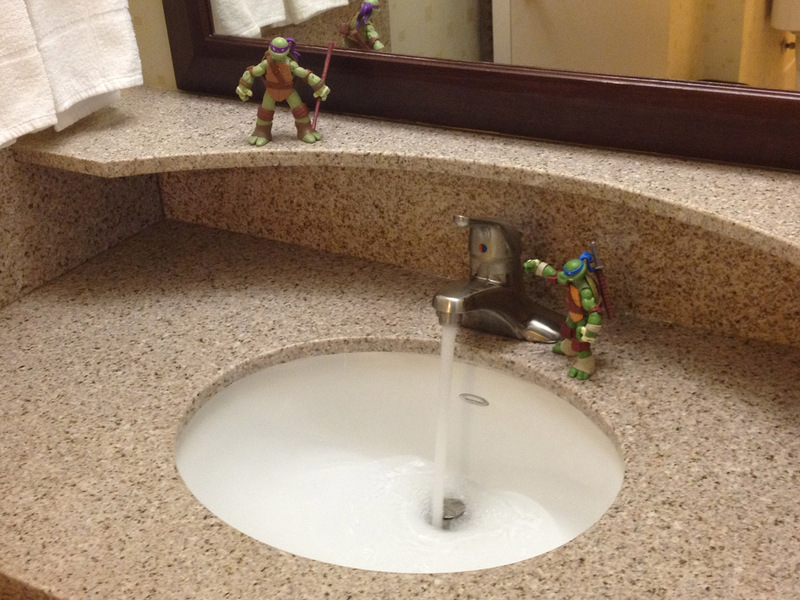 The Turtles were really captivated by the two level sink environment. It took my awhile to find a distraction, the toilet, not shown here. 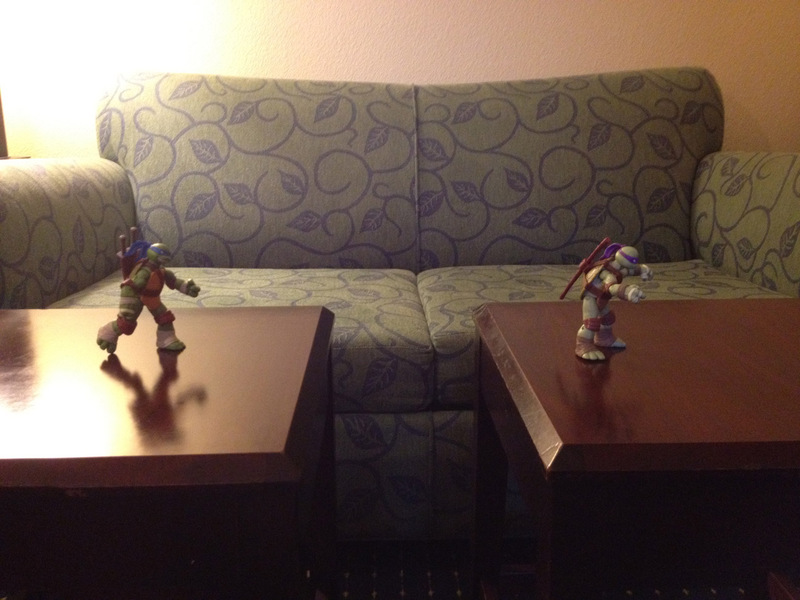 I love the new Teenage Mutant Ninja Turtles so much I took them on an all expense paid trip to Spring Hill Suites. Here they are practicing their jumps on the small square sofa coffee tables. Finally saw some of those Scary Little Ugly Guys full packs in the wild. But, series 3 wasn't too exciting, so I passed. 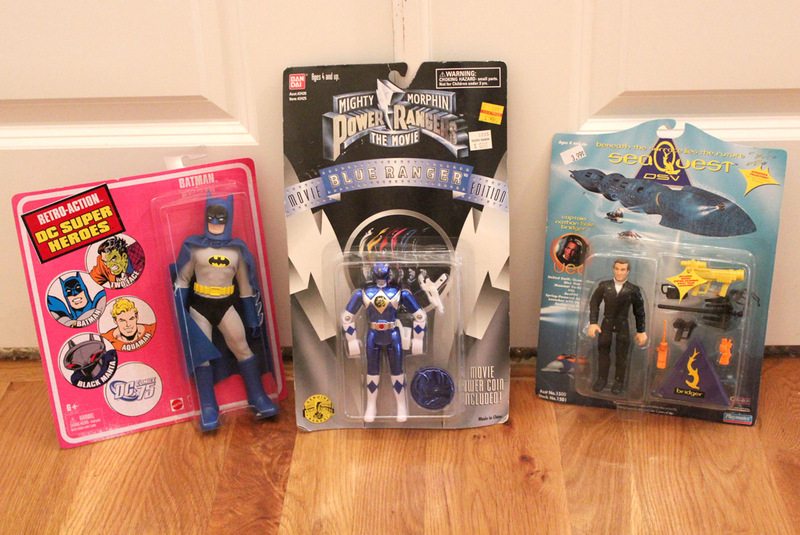 Just letting people know that Toys R Us had a bunch today. 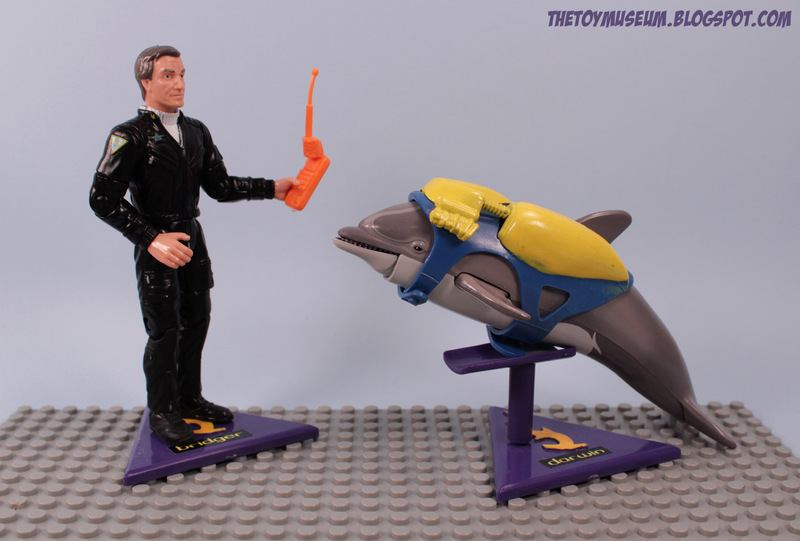 Now that I am home, and discovered the goal of this toy, I had to do a follow up video. Of course, it took twenty times or so, for that perfect dismount on camera.